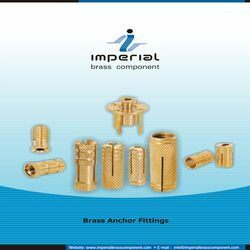 Imperial Brass Components’ stands among the no.1 fabricators of the brass fittings industry. The brass-pool cover anchor from our line-up is a component that comes with great strength and tenacity for a use over a long run. We also issue quality advisory notifications for our clients, to go with advanced post-sales support. We sell at industry leading prices. Looking for Brass Anchor Fittings ?